Led by Petty Officer Ellerbe, our unit toured the USS Rentz, now commissioned to aid the US Coast Guard in patrolling the South American seas for drug runners. The ship's crest is seen below. The vertical trident represents the sea god Neptune. The crossed missiles indicate the type of ship "Frigate with Guided Missiles." The cross on the shield symbolizes the ship's namesake, Chaplain Rentz. The motto "Dread Nought" tells all to have no fear for the ship is watched over by higher powers. Select cadets from across the Southern California region were invited to participate in a one-day SEAL training with active duty SEALs. Under cloudy skies, Cadets Laine and Kennedy from Escondido Battalion proved their mettle by completing this grueling challenge with fierce determination. Many thanks to MCAS Miramar Gunfighter Squadron for arranging this special opportunity and to Chief Atherton (SEAL) and Sr. Chief Sester (SWCC) for overseeing this event. Hosted by LT Kris Goland and LTjg Mike Haas we started our tour with a powerpoint presentation explaining the changing role of the U.S. Coast Guard during its fairly recent transition from the Department of Transportation to the Department of Homeland Security. This was followed with a tour of Coast Guard boats where we learned how the Coast Guard act as the "firefighters" of the seas, on call and Always Ready. The Coast Guard tour ended with a close up look at a search and rescue Jayhawk Helicoptor. As a team building event, the unit participated in indoor rock climbing. Cadets went from barely able to get a few handholds up to scaling the walls to the top! Cadets were paired up, with each taking turns belaying the other. The cadets toured the HSC-3 Merlins Helicoptor training facility and learned about helicoptor rescue missions and rescue swimming. After the helicoptor tours, the cadets were given instruction on the use of night vision goggles and then were able to try them out in a dark room! They how infrared and flourescent glow sticks affect night vision. They were able to see how these different forms of light could be used in night missions. Congratulations to Escondido Battalion and Training Ship Kit Carson for passing Annual Inspection! The morning inspection ended with a Chief Petty Officer Pinning Ceremony as Petty Officer George Mick was promoted to the rank of Chief. The pinning was lead by Regional Director LCDR Bob Rombach, while the actual pinning was conducted by Mick's mentor - his mother, INST Joan Mick. After applying anchors to his collar tabs, she leaned in for a kiss on his cheek to seal the deal. Congratulations CPO Mick! The cadets spent the afternoon after Annual Inspection learning the basics of SCUBA. This was a first for most of the cadets, but an activity we hope to continue every year! Our tour began with fire crew volunteers showing the cadets how they suit up to fight fires aboard ship. They described the different types of fires that crews could face and how their techniques would vary depending on the type of fire. Following this presentation, they watched sailors take part in a fire drill, manning hoses that pulled pressurized sea water. The unit also climbed to the top of the island aboard the flight deck to visit the helm then trekked down to the depths of the stern which housed the impressive 30 ton anchors. The day ended with a visit and instruction from a Navy Corpsman who led the cadets in first aid instruction using a mannequin with simulated injuries. Many thanks to the crew of the USS Ronald Reagan for providing our unit with such a special day. The unit arrived at MCAS Miramar 50-meter Water Survival Training Pool and joined Gunfighter Squadron to complete annual Swim Qualifications. SGT Timminy Haycock led the cadets through a series of swim tests to prepare them for their summer trainings. Mark Pidcoe followed Swim qual with a SeaBotix ROV demonstration in the pool. The cadets enjoyed taking turns operating the mini ROV in the pool and trying to pick up a water bottle full of water without crushing it in the ROV's powerful arms. In the afternoon, both units returned to Gunfighter Squadron HQ for close order drill led by two active duty Marines. The morning began with Color Guard Training at Orange Glen High School NJROTC. Lessons on properly holding a rifle, learning formation and presenting arms were interspersed with classroom instruction and instructional videos. Many thanks to Commander Charles Jenkins and Master Sergeant Keith Porter of OGHS NJROTC. We're looking forward to continued collaboration with this fine organization. Following chow, the unit travelled to MCAS Miramar joining Gunfighter unit for Marine Corps Martial Arts Training. After putting the cadets through a series of exercises, they were given instruction on close quarter combat. Donning protective gear, the cadets were armed with padded batons while "attackers" approached from the sides. 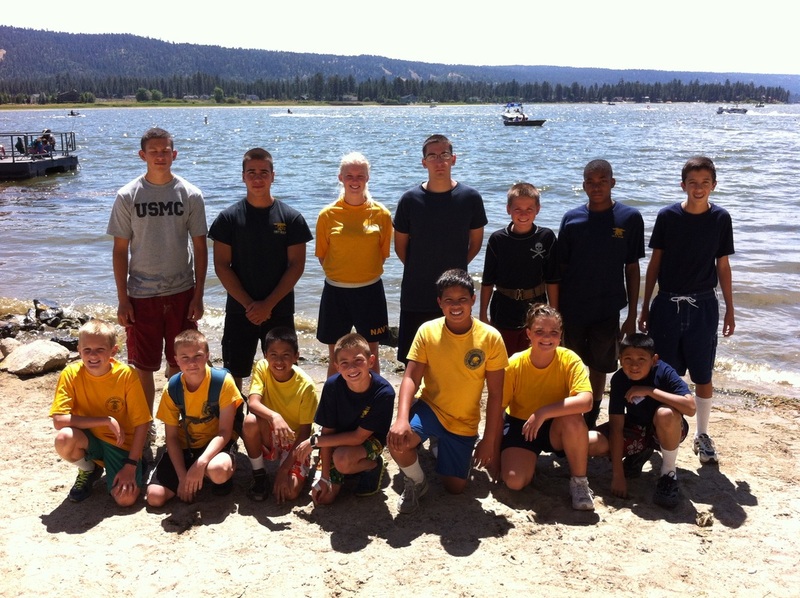 Active duty Marines supervised and provided instruction. Thanks to SSgt. Westmoreland for his help in coordinating this fun and instructional event for the cadets. dinner duty. Dinner was followed by Flagship training in small groups. LCDR Tom Blackshear visited for an impromptu personnel inspection. The evening was capped with leadership training by the unit CO. Returned Sunday -- looking forward to next year's outing! 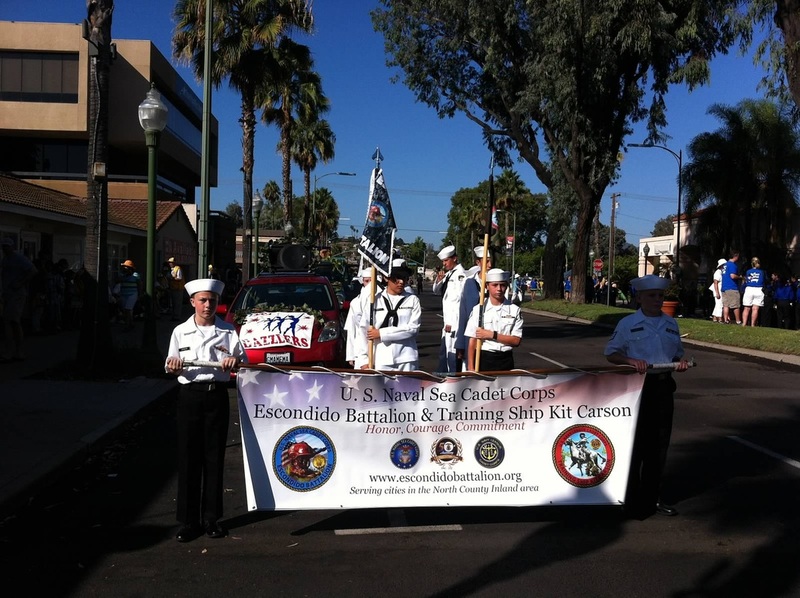 For a second year in a row, Escondido Battalion and Training Ship Kit Carson participated in the Grape Day Parade followed by the Grape Day Festival. Like the year before, temperatures soared into the 90s but the unit stayed cool and collected as we marched in cadence down Grand Ave in downtown Escondido. Once again the cadets manned a recruiting table at Grape Day Park and spread the word about the Sea Cadets program. Words of Comfort Hope & Promise Beach Day Bash recognizing Marines for their service. Working in conjunction with the Sons of the American Legion our unit helped to set up canopies and serve food to the Marines. Before greeting the troops when they arrived, the cadets were free to climb aboard static displays of military vehicles where active duty Marines provided information about each vehicle. The cadets also enjoyed walking around the site and mixing with members of other service organizations. One highlight of the day occurred when a neighboring service organization used a t-shirt cannon and shot t-shirts into the crowd. Many of our cadets took home a souvenir that day! Hoorah to our proud Marines and thanks for their service! Honoring our nation's veterans, Gunfighter Squadron and TS Top Gun from MCAS Miramar joined Escondido Battalion and TS Kit Carson in a parade down Main Street Fallbrook. This long-standing parade has grown in recent years as America has increased its recognition of veterans. The combined units looked impressive in their winter dress blues and despite the blending of the two units they did a fine job marching in sync. Several cadets stayed after to have lunch with the VFW and also help serve and bus tables. U.S. Naval Sea Cadets from the Escondido Battalion and Gunfighter Squadron based at Miramar took part in a bivouac and marksmanship drill over the weekend of Nov. 16 at the Escondido Fish and Game Association. About 50 cadets arrived Saturday and camped overnight. Sunday, they headed to the firing range and shot rifles under the direction of gun safety officers from the Fish and Game Association. Cadets rotated through in groups of 10. Each cadet had 40 shots. Six cadets from Escondido earned marksmanship ribbons. Two cadets from Gunfighter earned sharpshooter status. Other activities over the weekend included personnel inspection by CDR Bob Rombach, leadership training by LTC Patrick Healey, a tug-of-war and flagship training. The cadets also were in charge of chow, cooking hamburgers and hotdogs. The weekend was a success! We look forward to returning for pistol training later in the year. The unit was granted special access to Submarine Squadron 11, aka SUBRON 11, at Naval Base Point Loma to tour the USS San Francisco (SSN-711). Launched in 1979, this Los Angeles-class nuclear submarine, is the third ship or boat of the United States Navy to be named for the city of San Francisco. During the tour, the cadets were able to look through the sub's two periscopes, see where the 144 crewmen ate and slept, saw the torpedo room and learned what life was like living in such close quarters. Our hats off to Petty Officer Benson, who led our tour, and to the rest of the extraordinary crew of the USS San Francisco. Wreaths Across America is a national organization on a mission to REMEMBER those who’ve served in the military, HONOR their service and sacrifice, and TEACH others to do the same. 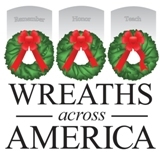 Each December, wreaths are laid upon the gravesites at National Cemeteries across all 50 states.